We have become major fans of Green Apple these days. I am just about discovering the versatility of this wonder fruit! After Green Apple Pickle, it was Green Apple Chutney, now is the turn for Green Apple Roti. I make phulkas on a regular basis which requires no oil. I was apprehensive whether I could make phulkas with Green Apple, but my fears turned out baseless. These rotis puffed up (on the flame) so well like ordinary phulkas, I was truly impressed! Yet another way to sneak in fruits for picky eaters! Try these out! In a mixing bowl, add all the ingredients and knead well with very little water. Since the grated apple will have some moisture, add water gradually and make dough. Cover the dough for about 10-15 min while the rest of the stuff is arranged. Make about 12 equal balls out of the dough and roll out rotis and heat them on a hot griddle/tava. I slightly warm the rotis on each side and then place on a phulka maker directly on the flame. I take them off the flame when they puff up. I like to store in a hot case and serve them warm and soft with some curry! After I got back from India, my hands were itching to delve into baking. So after more than 4 months of non baking days, I finally started baking. This week I have been baking almost everyday. My older one has gotten used to eating home baked after school snack so much that she directly peeps into the oven as soon as she gets home. So I am kind of being challenged. The other day when I didn't bake anything, she kind of looked at me like 'what? you didn't bake anything for me today?'. By the way, she gave me a list of items she wants to bake at home..So expect a lot of (?) baking from me for some time! Anyway coming to this recipe, I read a lot about the goodness of barley when I was in India. The dietary fiber in barley is highly beneficial. More info about barley here. So I thought baking with barley flour would be a good way to start. I googled and found that Priya of priya's easy n tasty recipes has already baked a bread with barley flour. Needless to say I adapted her recipe to make my own version of the bread. Also I have made a vegan version of the bread. So please free to substitute vegetable oil for butter , water for milk. Measure all the dry ingredients and mix them in a mixing bowl. Chop, measure and mix the almonds to the dry ingredients. Make banana puree adding the over ripe bananas, oil , sugar and water. Mix the wet and dry ingredients and gently mix them. The batter shouldn't be too runny. Prepare a bread pan either by spraying oil or by spreading a parchment paper. I found using the parchment paper very easy. Bake for about 40-45 min. I baked mine for 45 min. Make sure the top is brown and firm and a tooth pick inserted in the center comes out clean. Cool on a rack in the pan for about 5 min and then slice it after it cools completely. While I was looking for some snack ideas on the internet over the past weekend, I chanced upon a blog where I found this recipe. Needless to say I bookmarked it and I was waiting to make these..Wholesome, healthy and I knew the kids would love these and sure they ate without any fuss. I made subtle changes to the original recipe. One - I couldn't use cheese. Two - since the kids don't eat spicy I omitted green chillies. Three - I spread some tomato ketchup first and then spread the filling. Also I had to bake for about 13 min each side. Boil and mash the mixed veggies and Potatoes. To the mashed veggies add the rest of the ingredients except the bread and mix well to make the filling. Cut out the sides of the bread slices and join each slice side by side by using some water so that they overlap about 1 cm. Apply tomato ketchup and then spread a thick layer of the filling on the bread strip. If using cheese now is the time to sprinkle the cheese. Then roll the bread strip to make a huge cylinder shape. Wrap in a plastic wrap and freeze for 30 min. Then carefully pull it out of the freezer and unwrap and slice into 1 cm thick discs. I had to bake them 13 min on each side to get a crispy look and golden brown hue. Serve these wonder swirls with ketchup or any dip of individual preference. These swirls go to the 'Bookmarked Recipes Every Tuesday' event (sep 28 2010) by Priya (Yallapantula) Mitharwal. Note - One tip I found interesting is that the quantity of dry ingredients should be equal to the quantity of wet ingredients for quick breads. So measure carefully while adding the ingredients. Make banana puree adding the over ripe bananas, oil , lemon juice, sugar and water. Bake for about 40-45 min. I baked mine for 39 min and switched off the oven and left the pan in the oven for 5 more minutes. Vegan Banana-Almond Bread makes its entry to Champa's Bake Off event for 10/1/2010. Green Apple chutney is a new find for me. I usually make green apple pickle but this time I wanted to check out this version and it turned out just great. It can be a salad too if the spices are adjusted! Yet another way to eat the tart green apples!! Don't you all think? In a mixing bowl, add grated green apple and salt. Make a paste of coconut, green chillies and coriander leaves and mix it with the grated apple. In a heated kadai/sauce pan, add oil and the seasoning and mix it in the chutney. Optionally add grated carrots and/or roasted methi powder to add a twist!! Add curd/yogurt to the chutney to make Green Apple Raitha (Perugu pacchadi). 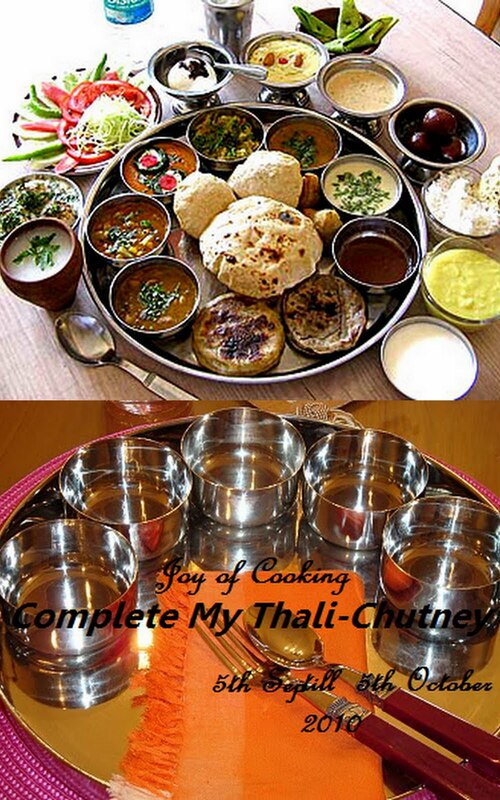 Also this goes to Jagruti's Complete My Thali - Chutney event. I bought a huge cauliflower from last week's farmer's market trip. And as all of us are aware, cauliflower gets brown very soon and so I had to make something fast and finish the cauliflower. So when I was looking through all the recipes I had earlier bookmarked from fellow bloggers, I found couple of them very interesting. So here I am posting two such recipes which I made using 'Cauliflower' as an ingredient. Incidentally this post goes to Nupur's BB7 - Iron Chef Edition. Cauliflower-Kasoori Methi Curry - The Cauliflower-Kasoori Methi Curry was inspired by Priya(Yallapantula) Mitharwal. I made very subtle changes to the original recipe, but stuck to the original for most part of it. What is very interesting and delicious about this curry is that the main flavor comes from kasoori methi (Dried fenugreek leaves). We all thoroughly relished this curry, thanks to Priya(Yallapantula) Mitharwal for sharing this recipe. In a sauce pan, heat oil and add the mustard seeds and jeera. After the mustard seeds splutter, add the chopped onions and saute until they are golden brown. Add the chopped tomato, blanched cauliflower florets, dhania-jeera powder and turmeric. Cover and let them cook until almost tender. Add amchur powder, mirchi powder, salt and garam masala and mix well. Cover and let the curry simmer for a couple minutes. Switch off the flame and serve the curry with roti or rice. Cauliflower Adai - My idea of cauliflower adai is from Umm Mymoonah of Taste of Pearl City. I had bookmarked this recipe almost 5-6 months back. Thanks to Umm Mymoonah for this recipe. This is a very simple recipe which we, south Indians, prepare almost regularly. But the addition of cauliflower was new to me. The original recipe uses Brown rice or Idli rice. I used Idli rava instead. Also I omitted Red chillies and onions too as I was running short of time! Barring these changes I think I followed the original recipe. Soak all the dals for 5-6 hrs and coarse grind the batter. The batter should be of pouring consistency. Blanch the cauliflower florets and finely chop or grate them. I used only 1.5 cups of batter for breakfast today. Add salt and chopped coriander leaves to the batter and mix in the finely chopped cauliflower too. On a hot griddle/tava, pour the batter and spread it around in a circular manner. Spray some oil and cover. Turn the adai to the other side after done. I had just a little spinach left and I was pressed for time on one morning and so I cooked up this Palak rice. I was pleasantly surprised to see that my family enjoyed eating it for lunch. Please feel free to tweak the recipe by adding other vegetables or sauteed Paneer or sauteed Tofu. Also adjust the spice levels as per individual preferences. Here is how my family liked..
Cook Rice and let it cool down in a wide bowl. In a sauce pan, heat oil and add the seasonings and saute chopped onions. After the onions are sauteed, add tomato paste or chopped tomatoes , chopped green chillies and turmeric. Grind the blanched Palak (Spinach) and coriander leaves (Kothimeera) add to the mixture. Switch off the flame and add salt and mix well. Add this mixture to the cooled rice and mix well. Check for salt and squeeze in some lemon juice if required. I had this huge cabbage sitting in my refrigerator and we were getting tired of eating different types of cabbage curries. Then I remembered that my sister's mother-in-law (who is, by the way, a great cook) makes chutney out of cabbage and so I made a quick call, got the recipe and made it for dinner. To give it a twist, I added a little tomato. I am glad I had this idea in mind. Reactions at home?? It is anybody's guess ..I mixed it in Yogurt(Curd) and I loved it with chapatis for dinner! Heat a wok/kadai/sauce pan and add oil and the rest of the seasonings. After they are properly roasted, add the chopped cabbage, chopped green chillies and cook the cabbage without adding water. After the cabbage is almost done, add the chopped tomato and saute until tender. Add salt, sugar, and tamarind juice as per taste and let the mixture cool. Grind into a coarse paste and serve it with hot rice and ghee. Cabbage-Tomato chutney makes its way to Jagruti's 'Complete My Thali - Chutney'. Spaghetti is one of those items which the kids love to eat at home. I like to sneak in some veggies and herbs too. I sometimes also sneak in some whole wheat spaghetti. This also makes way into my 8 year old's lunch box. Initially I was hesitant to pack spaghetti in her lunch box as I thought it would become cold and not so easy to eat. But my daughter says she like spaghetti cold. So I was relieved to note that I have one more choice for her lunch box. Here is how my kids love .. Boil Spaghetti as per the instructions on the package. Boil the mixed vegetables separately. In a sauce pan, heat olive oil, add pasta sauce and after it simmers, add the boiled mixed veggies. Mix in some shredded cheese and salt as per taste. Add the boiled spaghetti and mix well and sprinkle the Italian herb seasoning. PS - I would like to change the seasonings if I were eating it, by adding green chillies, coriander leaves, coconut powder/paste either in addition to the Italian seasoning or instead of it. If interested, there is some interesting trivia about Vaamu / Ajwain here. Make the Bajji batter (the batter should be slightly thick like Idli batter) with Besan, water, Salt and Mirchi Powder. Heat oil in a wok/kadai and dip the vaamu aaku in the batter and gently slide in the oil and fry until golden brown. Repeat until all the leaves are done. I like to sprinkle Black salt (kala namak) after they are done. I first prepared mixed vegetable pickle upon the insistence of my cousin, Mallika. She was in fact reminding me to make this for a very long time. Finally I made this and I am glad I gave it a try. Thanks to her, we have an enjoyable pickle to add to our menu! We can actually have it as a salad, if we reduce the spices and seasonings. It gives a nice crunchy feel and the kids will love it too as a salad (a nice way to sneak in veggies !). Actually using Chayote squash (Bangalore vankaya or seema vankaya) in a pickle was very new to me but it is now a regular at home. Also my pickles are usually very mildly spiced. So feel free to adjust the flavors as per taste. Finely chopped florets of Cauliflower can also be added to the mix. * The first time I made this pickle, the chopped lemons gave a very bitter taste so the next time I omitted them. But my cousin says she never had such experience with adding chopped lemons. So please check the taste of lemons before deciding to add it to the pickle. Just after mixing all the ingredients, this is how the pickle looks. In a mixing bowl, Add the finely chopped chayote squash, carrots, mango, lemons, green chillies and ginger. Add salt and turmeric and leave it for about 10-15 min. Mix them well and add the rest of flavors. Squeeze in some lemon juice if the mango is not too sour or as per taste. Finally heat some oil and add the rest of the seasoning and after the mustard seeds splutter, add the seasoning to the pickle. Let the pickle rest for about 6-8 hrs so the flavors are all mixed well and the juice oozes out. Make sure to store the pickle in a refrigerator to retain freshness. A couple days should be fine even at room temperature. In a heated sauce pan , add a teaspoon of oil and saute the mint leaves and green chillies until they wilt. Add chopped mango and switch off the flame. The mango pieces need not be sauteed. Grind the mint , green chillies and mango pieces adding a little salt. I also added a few roasted dry red chillies to the mixture. In a small heated sauce pan, add oil and the seasoning spices and let them brown a little and let the mustard seeds splutter. Add this seasoning to the chutney and serve with steaming hot rice and enjoy! Mango-Mint Chutney rightly goes to 'Complete My Thali - Chutney' event hosted by Jagruti of Joy of Cooking. I have never heard of 'Manoharam', which is made by rolling crispy murukku bits in jaggery syrup. Because of the Indian Cooking Challenge this month, I got to know of this Tamilnadu delicacy and enjoyed making it and my family surely enjoyed eating these too!! There were two different versions of Manoharam, one with crispy murukku bits and the other was making boondi with a different combination on flours. I chose to make the former. Thanks to Srivalli and Lataji, for this introduction to an authentic Tamilnadu sweet. PS - The original calls for Raw rice, but I didn't have time for the process of washing the rice, air drying it and then powdering the rice. So I went with the store bought rice flour. Powder the yellow moong dal and mix it with rice flour. Add Ghee and mix well so the ghee is well incorporated into the flours. Add water to the flours to make a dough (chapati dough consistency). In a wok, heat oil to medium heat. Squeeze out the murukkus in oil and fry them to golden brown color and drain them onto kitchen paper towels. Break the murukku into small bits and keep them aside. In a separate sauce pan, melt the jaggery with a little water and strain for any impurities. Heat the jaggery syrup to get a thick consistency (Muduru paakam). A simple test for consistencey - when a drop of syrup is put in water, a hard ball must be formed. Switch off the flame and add the bits to the syrup and mix well making sure the syrup is coated uniformly. Grease palms and roll into medium sized balls and serve. I made bite size pieces as I had to attend to my 3-yr old at the right time and the whole thing solidified by the time I could return to this activity. But anyway, I am happy with the result as it is easier for the kids to pop them into their mouths without making a mess! !